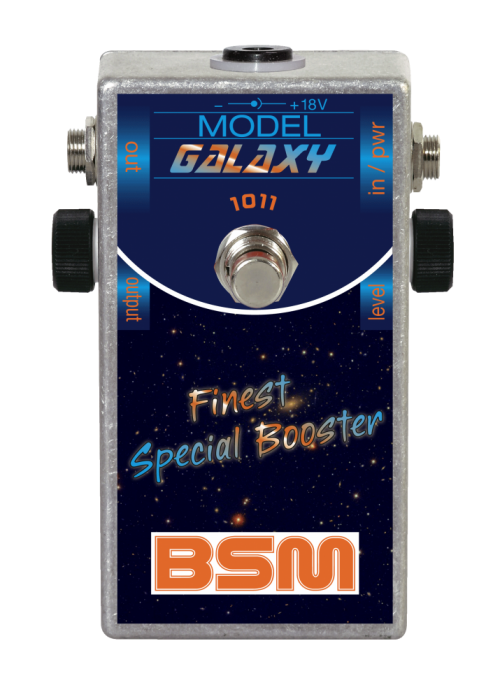 The BSM "Galaxy 1011" is a faithful recreation of the whole AIWA tape recorder sound stage, Ritchie Blackmore used from 1974 until today. This 18Volt unit contains the mic-preamp, the line output amp, the Marshall Factory mod and it holds a status LED. For best results you should power it with an 18v power supply. You can also power the unit with an internal 9v battery, but you will lose some dynamics and headroom compared to the standard 18v power. It is mainly intended for the users of a Marshall Major or clones of this. These are very special amps. With their special circuit design, they are very clean sounding amps and can not be compared to a normal Super Lead or similar (pentode design with EL34 or EL84 power tubes), that sound a bit dirty on their own. So for the real freaks the search for an unaffordable original AIWA 1011 could be well over. If you have any questions concerning our products, especially the BSM Galaxy 1011, our tech-head and mastermind Mr. Bernd C. Meiser would be happy to talk to you. So don't hestitate any longer and send him an email to info@treblebooster.net or use the contact form to contact him.